What's better than one deal? Several deals. 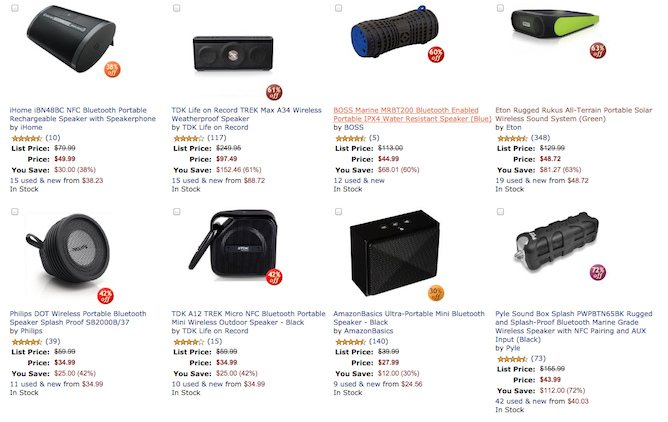 If you approve, you should check out Amazon's Gold Box offers today for discounts on a plethora of Bluetooth speakers. You could save anywhere from $12 to $152 or more, depending on which speaker(s) you pick. The biggest savings are on the TDK Life on Record TREK Max A34, a rugged, weatherproof speaker with an IP64 rating, additional Aux-In input, and a microphone (to serve as a speakerphone). It's discounted from $249.95 to $97.49. Another interesting option is the green Eton Rugged Rukus All-Terrain, which is also a rugged speaker with an IPX-4 rating, but has a solar panel on top that should keep the tunes playing indefinitely if you're out in the sun. The Eton's price is down to $48.72 from $129.99. Other cool — and well-rated — Bluetooth speakers include the Pyle Sound Box Splash ($155.99 to $43.99) and the BOSS Marine MRBT200 ($113 to $44.99). As with all Gold Box deals, these are valid only for today or until stocks run out. Free shipping is included for Prime members or on orders over $35.